After watching the movie — the Big Short again, it occurred to me that even though Canada’s housing situation is different than the 2007 US housing crisis featured in the movie, the concept to bulletproof your investment real estate portfolio is always worthy of discussion. It’s also timely, as there’s great deal of talk that Canada is the next market due for an economic and housing correction, especially in light of the “out of control” price increases that markets like Vancouver (which has already begun to correct), Toronto and to some degree now Victoria have been experiencing. Although Canada’s mortgage lending has always been more conservative than the US, there is always the possibility of things going wrong and people finding themselves in the situation of being financially overextended and forced to make unwanted choices such as walking away from a property, or being foreclosed upon. On the good news side, mortgage default rates in Canada are at about 0.28 and that’s still only about 5.7% of the US mortgage default rate which in the first quarter of 2016 were at 4.84. As mentioned above, the affordability index measured by the house price index and the rental housing index is high in most provinces but is now critical in the Vancouver and Toronto markets. In addition to the above there are emerging discussions about how stable are the major Canadian banks, given the amount of private sector debt they are supporting, including their mortgage lending sector. All of this is fueling talk of the supposed “housing bubble” bursting, especially in overheated real estate markets. Whether the bubble will burst or not remains to be seen at this point, but these considerations are why it is best to reduce your downside risk. While there is an expectation that the recent implementation of a foreign buyers tax in the Vancouver market by the BC government will help control the escalation in that market and improve affordability, the reality is that there is nothing an individual alone can do to control of current economic climate nationally, regionally or locally. The foreign buyer’s tax may have caused a pause in the Vancouver market while buyers, sellers, investors and relators figure out what impact it will actually have, but initial reports indicate that, in the short term, the sales activity figures have significantly dropped. And there is the question of what message and trust level this tax will send to foreign buyers and whether it will force them into other BC markets, such as Victoria where the tax is not required, or even to municipalities in other provinces. All in all, while there are still many good real estate opportunities to take advantage of in the current real estate climate in Canada, this is as a good time as ever to mitigate any potential risk and take steps to bulletproof your investment real estate portfolio. • be aware of what’s happening with business growth within the market and how that’s impacting jobs, population growth (including migration) and demographics. If people can’t afford to buy, but have stable jobs and good job prospects they will rent, which provides a reliable source of tenants for a real estate investor. So understand if the housing prices being offered in the market you’re considering (at the city, town and/or neighbourhood level) seem reasonable and how they compare to other similar cities, towns, etc. Another basic consideration is to buy properties that will appeal to both buyers and renters, and to buy in desirable locations, i.e. close to transportation hubs (transit stations), places of work, etc. Finally, your research should include a look at what’s happening in terms of housing starts, absorption, days on the market, vacancy rate, etc. • Are there resources and economic activities in place to attract businesses and jobs, and encourage population growth? Check with the market’s Economic Development Offices at both the regional and local level to discover what’s currently happening or expected to happen in term of major infrastructure projects. A market in a region that has a track record of weathering change well is an attractive prospect. On a personal level, you have control of how you much you invest and what impact that might have on your personal finances. A basic and very wise practice is to shield yourself financially: have financial safeguards in place such as building up your financial contingency reserve. Depending on your situation, this could be in the form of actual cash in an account, or it could also be a line of credit set up and ready for use. For each property in your real estate investment portfolio it is prudent to have at least two years’ worth of your cash flow shortfall on reserve. For example, if you are currently carrying a property for $100/month then you would want to have $2,400 set aside, in order to be able to fund that carrying cost for two years. If the property is in a market experiencing some major economic swings you may even wish to double that amount to $4,800 so that if the market goes into a downturn that you have extra buffer. A conservative approach is to avoid the minimum down payment. In fact, put 25% or more as a down payment if you can, so that you will improve your cash flow and if there is a downturn in the real estate market and the values decrease you have a buffer. Remember, the many people who found that their mortgages were “underwater” during the US housing crash. In these times of low mortgage interest rates, it is easy to forget that interest rates have been traditionally much higher. A wise approach is to stress test your current portfolio: consider what would happen if mortgage interest rates rose by 2, 3, or 5% or more? Could you accommodate that increase in your mortgage payments and what impact would paying such increase have on your cash flow and overall investment portfolio? Here is a link to calculate mortgage payments where you can determine what the change in rates would mean to your mortgage payments. Don’t have all your mortgages coming due at the same time. By staggering the renewal dates you’ll have some time to accommodate changes, especially increases in mortgage rates and payments. We don’t really know when interest rates are going to increase, so it’s best to be prepared. In these days of incredibly low interest rates, a wise strategy could be to put as much money toward reducing your loans as possible. If interest rates are lower at time of renewal of your mortgages, don’t go for the lower payment option, but keep the payments the same as you’re currently paying, so that the extra amount helps pay off your mortgages quicker. If you can increase the monthly (or biweekly) payment, or make an annual lump sum payment on the anniversary — do so, as this, once again, will help you pay off your mortgage quicker. Ensure that you have access to funds to assist you when it comes to make extra payments – you could use the positive cash flow that you’ve built up to make extra payments. Variable rate mortgages are great, but can catch you off guard when rates increase, especially as interest rates generally increase at a faster pace than the rate at which interest rates decrease. And don’t forget about the length of a mortgage term — the longer the term the more stable or predictable your largest expense in your portfolio can be, and this enables you to do better planning. In certain rare situations where you know for sure that you won’t sell the property within the next 10 years, depending on the rates, it may be worthwhile to lock in a mortgage for even a 10-year term. Consider setting up a line of credit on those properties that have a larger equity position(50% or more), so that if you absolutely needed to access funds to potentially expand your portfolio when the timing is right and the right property opportunity comes along, you could do so. There are times to sit and wait, and there are times to step up and buy. Is it a buyers’ market or a sellers’ market? There are opportunities in both types of market depending on your desired outcome i.e., flipping real estate vs. buying for cash flow, or whether you’re looking for a short term vs. a long term investment. Not all markets are going to experience significant drops at the same time. Even in the US during the “housing crash” not all markets experienced drops in housing values. We have seen some markets increase in value while others decreased. As markets shift there will be opportunities both currently and in the future, so don’t be fooled by all the negative talk in the media. The key to buying wisely is to identify and focus on those markets that are set for sustainable growth and purchase your properties while others believe the media hype and step back. For many investors, the goal of building a real estate portfolio is to create wealth and cash flow. We all know that this is not a straight line situation and that there are ebbs and flows in any real estate market. By reviewing your portfolio’s performance on a regular basis you are going to know which properties are performing well, which are not performing so well, and whether the poor performance is a chronic or acute issue. Selling a chronically underperforming property may not be ideal, but it might be a real option to consider. Sometimes a property’s poor performance becomes chronic for any number of reasons. For example, in a smaller town such as in Tumbler Ridge, BC — if one major employer closes down for a long period or permanently, then this will have a definite and long lasting negative effect on people’s jobs and their ability to pay rent and remain in the community. In such a case, particularly when there’s no or little sign of improvement in the future, it may be time to cut your losses and sell an investment property, especially if it is draining both financially and emotionally. On the other hand, you may wish to take the short term loss and “stick out the downturn”, but you should only do this after you’ve weighed the costs of selling such a property and reinvesting those funds elsewhere. This situation is where you’ve had good growth in an investment property in a particular market, but now it is stagnating i.e., the market is at the top of the real estate cycle. It is time to take the profits out of that market and move on. This scenario may also include the fact that you are fully invested and don’t have additional funds to invest in other rising markets, or you are maxed out for obtaining more mortgages and you need to sell something in order to have the funds to invest elsewhere and obtain a new mortgage. If a property is draining the cash flow from other properties in your portfolio and there seems to be no end in sight, then it might be time to sell that poor performer and enable your other properties to perform and provide you with the full returns from them. You could also take the funds from the sale of the poor performer and redeploy them to reduce the debt on those higher-performing properties, thereby increasing your return (cash flow). You can always consider improving the financial performance of your property by addressing things that could increase the rental rates you can charge for your property. Typically, this includes a renovation or upgrade to the property such as updating or adding new appliances; painting; upgrading the flooring, counters, cabinets; or upgrading the bathrooms. You do have to spend money upfront, but by knowing which improvements could enable you to boost your rents, and by what amount, you will gain a better understanding of what upgrades are going to be the most beneficial to you in the long run. With a little internet research on rental properties in the area you can gain a good understanding of what upgrades could net the highest rental return. As an example, if you were to add a dishwasher that costs $600, but it could enable you to conservatively increase your rent by $25/month, it only takes 24 months to have paid off that dishwasher and thereafter that additional $25 goes straight into your cash flow. I have provided a few steps to consider in order to bulletproof your investment real estate portfolio. While no one knows exactly what will happen in the various housing markets across the country in the next few years, taking steps to mitigate risk within one’s real estate portfolio will definitely help you weather changes that occur. If the markets in which you have invested do take an economic downturn, bear in mind there will be fewer buyers and more potential renters. Also, consider the fact that renters don’t necessarily want to pay more for better accommodations, but will look for the lowest cost for the most acceptable accommodations, in such a downturn. Such renters are mitigating their risks by undertaking such steps — they are lowering their expenses. As a property investor, if you have followed the seven steps I laid out above, you’ll be a better position and able to respond to a market downturn. And as a property investor, it may serve you best to also consider lowering your expenses anywhere you can. Usually the mortgage payment is your investment property’s greatest monthly expense, and personally speaking, this is the one expense I am focusing on reducing, in order to weather these interesting times. 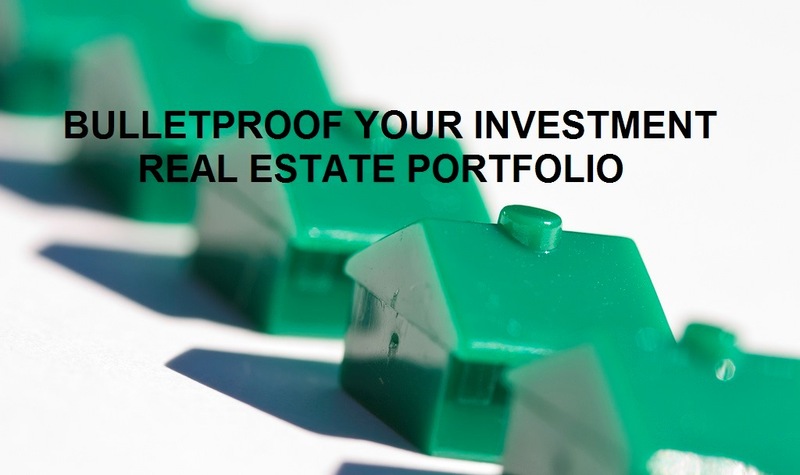 The post Bulletproof your Investment Real Estate Portfolio appeared first on Andrew Schulhof.